Wouldn't this technically be the trio; given that, well, aren't Palkia and Dialga technically made of Arceus, or something? AND THEY ALL SHARE THE SAME STATS ONLY MIXED UP. *They all have the same stats just mixed up. *They have similar moves, as seen above. *They look similar in appearance. *They all were created at the same time, as said in the article about the History of the Pokémon world. *I believe that Palkia controls space, Dialga controls time, and Giratina controls the only other thing, the afterlife. I doubt that Giratina represents life after death, but I do beleive he represents Death itself. He lives in a cemetary and is part ghost. Noname The afterlife would be a bit of a streach and I doubt they would do that in a pokemon game. Not really. The boxart proves nothing by itself, or Charizard, Blastoise, and Venusaur would be a trio. But with the other evidence shared among the members of this trio (similar typing, all half Dragon; similar moves at the same levels; similar origin for their names Diamond/Dialga, Pearl/Palkia, Platina/Giratina)... well it pretty much says it all. But until we get evidence that Arceus also made Giratina, which is undoubtedly the case, I would say, the dragon trio technically is unconfirmed. Come September, though, the whole thing will become clear. Yea. §#!π¥£!Ψ@Ϛ#µ 00:08, 16 September 2008 (UTC) P.S. Please join The User Post Gazette. 1: They don't have the power to do so. 2. Arceus, who lives in the SEVENTH dimension, has made it impossible for them to even WARP each other's dimensions. I also say the reason that Dialga and Palkia are apparently able to warp GIRATINA'S dimension is that Giratina's dimension is a parallel to the regular one, and you can't control one dimension without warping the parallel dimension in some way. Hey, I'm nineteen, practically venerable. I can call whoever I want a "kid." Just to set things straight: Hades does not "cause earthquakes". In the myth of Persephone, all he did was make the ground open. That's not an earthquake. The earth might shake in result of the ground opening, but Poseidon is directly connected to the occurance of earthquakes, whereas for Hades, they are nothing but a side-effect. Not the same thing. He does not deliberately make it shake beneath your feet, so he is not the patron of them (like Poseidon is). Anyone trying to argue, in jest or in seriousness, that Groudon is Hades...bwahaha. Yer tring 2 herd. And that "goddess of the earth" is no such thing. Persephone's mother is Demeter, patron of the harvest. The myth is also slightly deeper than that. Amateurs. "Dialga controls time and Palkia controls space, two aspects of the four-dimensional universe that the Pokémon world, like our own, is a part of. 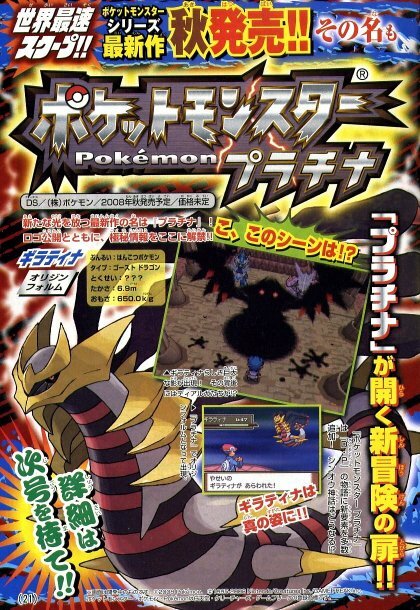 The final member, Giratina, apparently has control over other dimensions like the Distortion World, which may itself be a location with a fourth spacial dimension. " I know they're obtained at level one in HGSS but are they technically hatched from eggs? When I get my Dragon baby, will it say "hatched at Shinto Ruins" or will it say "met at Shinto Ruins"? This page was last edited on 20 December 2016, at 15:08.